Biomass is a biological material derived from living organisms such as plants. It can be used in many different ways; directly via combustion to produce heat, or indirectly after being converted into various types of fuel. The most popular biomass energy source is wood, in the form of logs, pellets or woodchips. 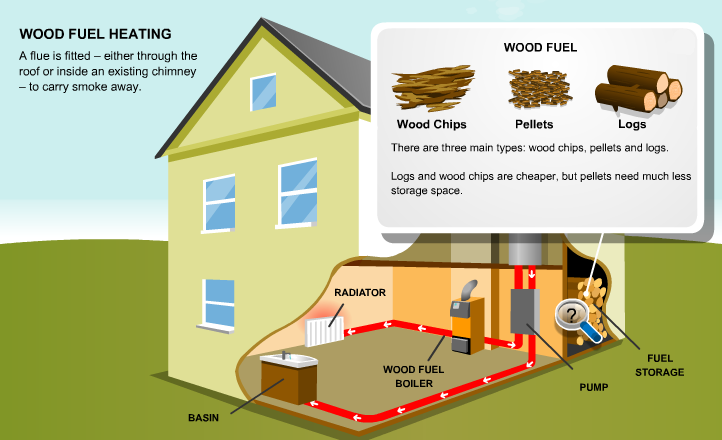 Burning biomass releases heat, which can then be used to heat homes, generate electricity and power vehicles. Here are the advantages and disadvantages of biomass boilers. Biomass is considered an environmentally friendly source of energy. This is because unlike coal, which needs much longer than a lifetime to regenerate, biomass is considered a renewable source of energy because it can be obtained quickly by replacing or growing new plants or trees. Biomass is considered a carbon-neutral form of energy because the same amount of carbon dioxide that is released by the burning process is later re-absorbed by growing plants. Not only does it supply us with energy, but it also helps with the disposal of wood and other materials’ waste. Replacing a coal or electric heating system with a biomass heating system can help you reduce your carbon dioxide output by up to 9.5 tons annually. Biomass energy is also a great way to dispose of waste wood. That means the system is even more sustainable if you burn your own wood instead of having it delivered. Biomass boilers and stoves qualify for the Renewable Heat Incentive scheme. This means you would qualify for periodical payments over several years. This helps repay your initial investment in a shorter time. Biomass boilers need more space than gas or oil boilers because the system is larger. You would also need some space to store the fuel itself, such as a hopper or wood store. One of the largest disadvantages of biomass boilers is the initial investment, including purchasing the boiler and having it installed, which is higher compared to traditional gas or oil boilers. Biomass boiler prices range between £4,000 – £8,000. However, the renewable heat incentive helps cover these initial costs, and you will save money in the long run by using a cheaper source of energy. Biomass needs a bit more work than traditional gas and oil boilers because you have to continuously supply the system with pellets or chips unless you use a hopper. Biomass boilers also need to be cleaned regularly, usually once a week. However, modern models make the process very simple or even incorporate the feature automatically, so you won’t have to worry about it at all.